'The Glass Menagerie' runs Thursday–Sunday through Sept. 28 in the Studio at 6th Street Playhouse. 52 W. Sixth St., Santa Rosa. Thursday–Saturday at 8pm; 2pm matinees, Saturday–Sunday. $10–$25. 707.523.4185. 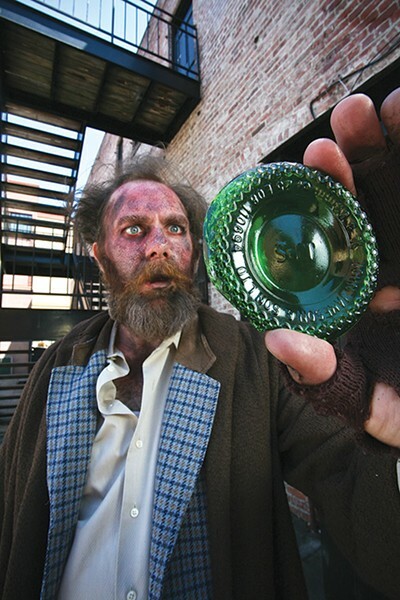 LOOKING GLASS Dallas Munger plays a drunken Tom, a man who rues his past. 'The future becomes the present, the present the past, and the past turns into everlasting regret if you don't plan for it." This warning, declared in Tennessee Williams' Glass Menagerie, has been interpreted many ways since the 1944 premiere of this gorgeous, fiercely loved play. Now 6th Street Playhouse is putting its own interpretation on that famous line, caustically uttered by the resentful, aging Southern belle Amanda (Jacquelyn Wells) to her would-be-poet son, Tom (Dallas Munger). Director Craig Miller, inspired by the quote's examination of past and future, has elevated the play from a memory into a vivid full-on alcoholic hallucination. What normally plays out on a living room set, now plays in the homeless Tom's demented head, as he mutters and barks beneath a fire escape in a New Orleans alley. Trapped in an inescapable loop of regret—predicted by his mother—Tom rages to the air. The characters of his past materialize in the alley as he replays the memories, using trashcans and wooden pallets in place of the usual faded furniture. In particular, Tom replays the night he finally abandoned his mother and mentally frail sister, Laura (Katie Kelley Stowe), following a "dinner party" in which a gentleman caller (an excellent Ben Stowe, alternating with Rusty Thompson) almost pulls Laura from the dreamy fantasy world she hides in. Fueled by sorrow, Tom is now trapped in a world of his own. It's a bold idea, born out of Miller's obvious love of the play, and whether it works or not will depend on how theatergoers feel about this kind of reinvention. I've always believed that theater is elastic. Plays can be twisted, pulled, bent and stretched, and then the script snaps back into place after the run is over, returning to its original form, ready for others to tackle it again. In the case of 6th Street's version, the concept works surprisingly well, bolstered by clever sound design that gives us noisy street traffic in the background, disappearing when Tom enters his memories and returning with a jarring rush whenever he's pulled back to the present. The cast is deeply committed but wildly uneven, keeping some scenes from achieving the depth they deserve, while others leap up raw, fully alive and unforgettable. Still, the show's built-in power is unstoppable, and Miller's gutsy vision makes for an evening of challenging and thought-provoking theater.